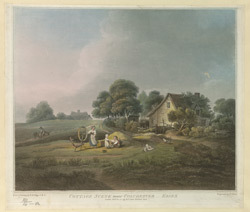 A picturesque cottage scene near Colchester in Essex by William Redmore Bigg. This is one of a group of four cottage views in Essex by Bigg. Colchester is in north west Essex, and was about 50 miles from London.